Have you ever wished you could just spend the days scrapping, relaxing, no cooking, no cleaning, with a bunch of good friends? I sure do.... often, and I think that a CRUISE would be awesome... so look what I found! Crop n' Cruise - Canada's Scrapbooking Cruise - this winter, in the Caribbean! If you have a group of you that want to travel together, you are eligible to win a free cruise. Go check it out.... I've heard some great things about the classes and the goodie bags! Now, back to some Scrapfest chatter.... when I wasn't teaching or in the booth, I spent some time in the very crowded Stamping Bella Booth....they had a great make n' take, and some fantastic new releases. I really love Billboard Bella... I didn't see her, but I'll have to make a trip and pick myself up one. She's so versatile.... love it! 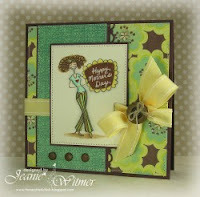 This card was designed by Jeanie and was posted on the Bella Blog..... there is some great inspiration on both blogs, so if you haven't been, grab a coffee and settle it! It will definitely put you in a stamping mood. Sure makes we want to ink up the Rubbah' as the Bella Babes would say! I'm also getting organized for some Fall assignments I have for Canadian Scrapbooker... lots of cool articles coming up and the latest webisode is online too! If you've never submitted, you SHOULD.. we love to see layouts from readers... love love love it! Just check the submissions pages for the current calls and send in a photo - that's it, easy! Off to my scraptable... lots of design ideas floating around in my head... I need to get some of them sketched before I forget!